The Siemens Sonoline G20 ultrasound distinguishes itself among similar models due to its next-generation, all-digital system architecture. This ultrasound system architecture optimizes individual imaging parameters for a wide variety of imaging applications and patient types. 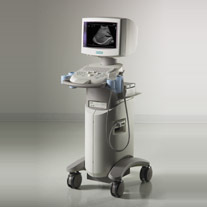 The Siemens Sonoline G20 ultrasound is slim and lightweight, with four swivel wheels for easy maneuvering from suite to suite and from patient to patient. Other workflow advancements include its intuitive interface, QuickSet user programmable parameters, a DIMAQ-IP integrated workstation, and TGO technology for one-button image optimization.